Nobody wants to fill their marriage with fear and insecurity. Fear and insecurity will kill a marriage…and nobody wants to live through a dying marriage. However, I have seen far too many marriages filled with fear because of the subtle actions of one partner. At first glance, these actions seem harmless. But, with a second look, you can see the damage they cause, the fear they build, and the insecurity they create. Let me explain three of these accidental-fear-building actions so you can erase them from your life and marriage. Impatience and anger. Of course, we all have moments of impatience. However, when impatience becomes the modus operandi in your marriage, fear is the result. 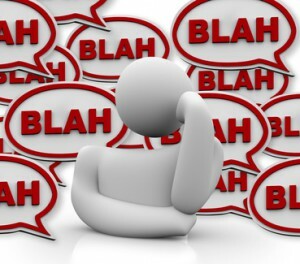 The spouse and family of a chronically impatient person feel the need to “walk on egg shells” to avoid the “next blow up.” They fear the impatient person’s anger and never know what will set it off…a spilled drink, a laugh at the “wrong” moment, a difference of opinion. The whole family lives in fear when they live with an impatient person. Arrogance and pride. Arrogant spouses constantly satisfy their own desires. They think of themselves first and, although they likely will not admit it, their spouses second. The spouses of arrogant people take second place to anything the arrogant spouse deems important…and arrogant spouses only believe only those things that revolve around them are important. As a result, their spouses live with the insecurity of knowing their arrogant spouse will not “watch out for them.” The arrogant spouse will not keep them in mind…or serve them…or make small sacrifices for them. They live with the insecurity of knowing their needs are unimportant to their spouse…and that creates fear and insecurity in the marriage. Holding a grudge. Minor slights, unintentional wrongdoings, and interpersonal injuries occur in all relationships. Marriage is no different. However, when one spouse holds a grudge, the other spouse begins to fear for their relationship. When one spouse harbors resentment over a slight they have suffered, the relationship is at risk. The one holding the grudge and harboring the resentment begins to fear another slight. Their mind becomes clouded by that fear and they may begin to misinterpret behaviors in a negative light. Now the other partner experiences the fear and insecurity of being misunderstood. A downward cycle of fear, resentment, insecurity, and bitterness has begun. If not addressed through apology and forgiveness, this cycle only ends in one way, a dying marriage. These three actions unintentionally build fear and insecurity into a marriage. If you find yourself engaging in any of these three actions, stop and breath. Consider what is more important…your marriage or your impatience? Your marital health or your pride? Your long-term happiness in marriage or the resentment you harbor? Court your spouse. Do what you did when “love was young.” Remember how you worked to “woo” your spouse while dating? Do it again. Write love notes. Dress up for them. Talk with courtesy and kindness. Do little things you know they will enjoy. Sit together. Hold hands. Make small talk. Learn about them, their day, their fears, their dreams. In words and actions express how much you delight in your spouse. By practicing these four actions you can build a stronger, healthier marriage. As parents, we do not want our children to become pushovers. Sure, we want our children to be polite. We want them to listen to credible authorities and obey legitimate requests. But a pushover? No way! Instead of becoming a pushover, we want our children to stand for what is right. We want them to remain firm in their conviction and even refuse to conform to foolish pressures and senseless requests. I hesitate to say it, but we even want our children to respectfully disobey any authority that makes an improper demand. No, we don’t want our children to become pushovers, victims to the bullies of this world. We want them to become polite people who still stand firm in their convictions and set clear boundaries that communicate what they will and will not allow in their lives. How can we help our children develop this skill? Here are 5 tips to help. Teach children to value themselves. We begin to teach children to value themselves by valuing them ourselves. When our children see adoration and love in our eyes, they see themselves as valuable. When we respect their ideas and even allow their ideas to influence us, our children learn to value themselves. As we respond to our children’s emotions with empathy and kindness, our children know we value them. When we interact with our children respectfully and in a polite manner, our children’s sense of value grows. 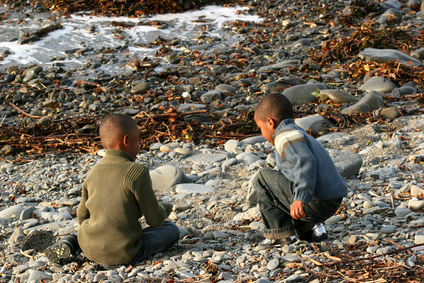 We teach our children to value themselves by valuing them in our interactions and with our words and actions. Give children significant chores. Make sure they understand how the chore they do helps the whole household function more smoothly. Let them know they play an important role in the household. Don’t redo the chore after them. If you do, their work becomes insignificant. Instead, take the time to teach them how to do the chore right and appreciate what they do. When they do the chore, thank them. In so doing, you teach your children to value themselves (see bullet #2). Discipline with respect. Loving discipline teaches self-discipline. Self-disciplined people are less likely to be pushovers. To discipline with respect means to teach, not just punish. Loving discipline teaches right behavior. It explains the values behind the expectation and right behavior. Loving discipline does not embarrass in front of others; it teaches in private. Loving discipline is not harsh; it is firm but considerate. Loving discipline is not overly demanding; it is patient and aware of developmental abilities. Loving discipline builds strength of character and integrity that is not easily pushed around. Teach your children to stay C.A.L.M. (an acronym from Dr. Michele Borba). When confronted with a situation in which they must respond assertively, your children can use C.A.L.M. (after you teach them how). They can stay (C) CALM and make an (A) ASSERTIVE statement while (L) LOOKING the other person in the eye…and (M) MEAN what they say. Teach them how to do this through example and practice. Following these 5 tips can teach your children to not become a pushover. Following these 5 tips can help your children become a polite, respectful person who will still stand firm in their convictions. That’s a balance our children need to learn. “Our choices become our actions. Our actions become our habits. Our habits become our character. conversations, fun times, and loving interactions it begins with your choices and actions. If you want your family to become a place of refuge, fun, and security, it begins with choices and actions carried out on a consistent, daily basis. The big one time events do not shape our families for the long run. It’s the choices we make on a consistent basis that become the actions of our daily lives. As we engage in those actions on a consistent basis within the family, we form family habits. Those habits shape our families’ character and determine our families’ destiny. That’s where honor, grace, and celebration come in. When we consistently choose to practice honor, grace, and celebration in our families, we develop families filled with respect, intimacy, security, and fun. Here are some great daily actions that will help you develop an amazing family character and destiny. Honor your family with courteous words and polite actions. Honor your family with expressions of gratitude and appreciation. Honor your family with compliments, statements of adoration and praise. Honor your family with your time. Honor your family by becoming a student of your spouse and each child. Honor your family by serving your spouse and children. 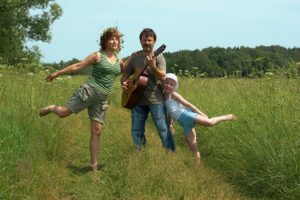 Show your family grace by accepting and even celebrating differences in talents, interests, and opinions. Show your family grace by initiating the resolution of any disagreement. Show your family grace by putting your spouse’s and your children’s interests ahead of your own. Show your family grace by forgiving quickly. Show your family grace through discipline, setting and enforcing limits in love. Celebrate your family by making it a point to play and laugh together. Celebrate your family with dinner time together. Celebrate your family by acknowledging effort toward a goal as well as accomplishments. Celebrate your family by encouraging and supporting your spouse’s and your children’s dreams. Celebrate your family by worshipping together. Make a choice to put these actions into daily practice. In doing so, you will build a family who practices honor, grace, and celebration habitually. Honor, grace, and celebration will form the foundation of character in your family and shape your family’s destiny. Who knows, if enough families make the choice to make honor, grace, and celebration the habit of their family, we might just change the world! FDR adored his father for two reasons. First, they spent time together engaged in mutual, meaningful activities. His adoration “grew out of a companionship.” Children spell love T.I.M.E. Spending time with our children will communicate how much we love them. Second, his father took the time to understand his child’s problems, even if they seemed insignificant through his own adult eyes. By “understanding the little problems,” FDR’s father accepted FDR’s concerns as important enough to address and thus FDR as significant as well. He validated FDR’s significance and value in his own life and as a person. All our children need that. 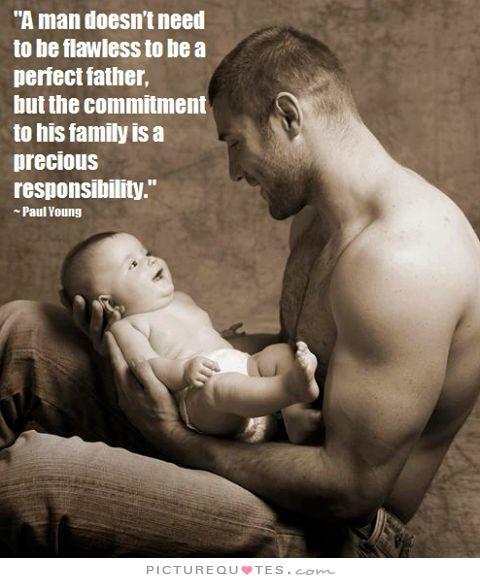 This, to me, is a beautiful description of the kind of fathers we need in our world. We need fathers who live a life of character, a life worth emulating, a life that is the “highest ideal” one could hold up for our children. Fathers need to be men of character—”straight and honorable, just and kind”—so our sons have someone to admire and emulate and our daughters have an image of how a “good man” lives his life and treats women. They spend time with their children. They take time to understand and empathize with their children’s problems (no matter how small the problem might seem to our adult senses). They exhibit personal character that represents the “highest ideal” we could hold up for our children to emulate. As fathers practice these three aspects of parenting, they will prove great fathers…and great fathers produce great children. 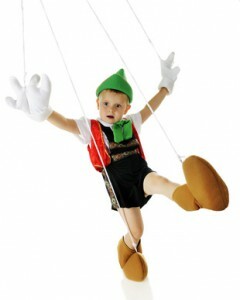 Remember what the Blue Fairy told Pinocchio? She said, “A lie keeps growing and growing until it’s as plain as the nose on your face.” A research team from University College London recently observed that a lie also results in a declining response in our brains (Read more in How Lying Takes Our Brain Down a ‘Slippery Slope’). Specifically, they discovered the amygdala, a brain area associated with emotional response, reacted strongly when a person first lied for personal gain. However, with each subsequent lie, the amygdala response declined and the magnitude of the lie increased. In other words, one lie set the person on a slippery slope. With each lie, the person lying experienced smaller and smaller negative emotional reactions in response to the lie. This seemed to allow the person to tell more lies and lies of greater significance. That is one slippery slope I want to keep my family off. Unlike Pinocchio, I want to keep noses short and brains active in my family by promoting honesty…and here’s how to do it. Model honesty. Whether you are speaking to your spouse, your child, or a friend, speak the truth in love. Our children follow our example more easily than they follow our teaching. So, model honesty. Avoid setting your children up. Don’t ask questions that invite your children to lie, especially if you already know the answer. For instance, if you know your child did not take out the garbage, don’t ask “Did you take the garbage out?” If you already know they broke the dish, don’t ask “Did you break the dish?” Don’t invite the lie. Simply state the truth in love. Reward honesty; discipline the lie. When your children tell the truth, acknowledge their honesty. Let them know how much you value their honesty and respect the courage it takes to state the truth. You may still have to discipline misbehavior. However, even while disciplining misbehavior, you can still acknowledge your children’s honesty. On the other hand, dishonesty may result in further discipline. After all, honesty betrays trust and damages relationship…which brings us to the last tip. Teach the value of honesty. You can do this in a number of ways. Talk about a character in a story or movie and discuss how their honesty or lack of honesty affected them. You can talk to them about their own experiences or their friends’ experience of honesty or dishonesty as well. You may also discuss the role models of honesty such as Abraham Lincoln, George Washington, or other people you know from history or current times. These four tips can promote honesty in your home…as well as shorter noses and more active brains. So remember, a lie is as plain as the nose on your face. Practice honesty. I wonder what Jesus would say about marriage? Of course He did talk about marriage some. But, imagine if He had thrown a “section on marriage” into the Sermon on the Mount. A healthy marriage really is countercultural. It is established on the principles of personal commitment, humility, service, sacrifice, and love. Such a relationship will have a positive impact on your children and leave a lasting impression on all those who have the joy of witnessing a godly marriage, a countercultural love. All parents want to raise children with a strong sense of right and wrong. However, most parents don’t realize how early—surprisingly early—this moral behavior and thought begins. Jean Decety from the University of Chicago (and his associate, Jason Cowell) demonstrated that parents influence their children’s moral development as early as one year old! He showed a group of 73 toddlers (12-24 months old) two types of animated videos: one in which characters engaged in helping and sharing or one in which characters exhibited pushing, tripping, and shoving behavior. At the same time, they measured the toddlers’ eye movement (gaze) and brain waves. Afterwards, the researchers offered the toddlers a choice of two toys: one representing the “good” animated character or one representing the “bad” character. What did they discover? First, toddlers looked at and tracked the “good,” pro-social characters longer. They showed more interest in the characters who exhibited positive moral actions. In addition, toddlers experienced different brain wave patterns when witnessing the prosocial behavior and the antisocial behavior. But, these differences did not impact which toy the toddler chose. There was one factor that differentiated which toy the child reached for, regardless of the length of their gaze at the “good” character or the difference in the brain wave patterns associated with the prosocial/antisocial behavior. An additional distinct brain wave pattern was associated with which toy was chosen. This additional brain wave occurred just after the toddler witnessed the behavior of the animated character and it differentiated which toy the child chose. Now for the really interesting part! The researchers discovered what may have contributed to that distinct brain wave pattern after reviewing questionnaires completed by parents prior to the research. These questionnaires measured parental values around empathy, justice, and fairness as well as their child’s temperament and demographics. 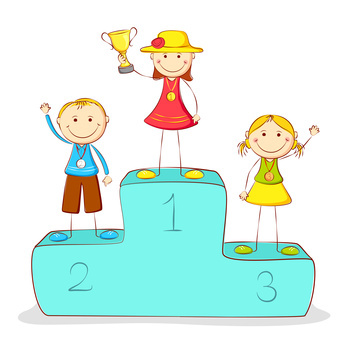 Parental sensitivity to justice distinguished toddlers’ who reached for the “good character” toy from those who reached for the “bad character” toy! In other words, the parents’ values around justice impacted how their children’s brains work and whether their 12-24 month old reached out for the prosocial or antisocial character. Cultivating your own sense of justice. Discipline fairly. Do not practice the “Do as I say not as I do” mentality. Instead, set the example of living and accept the just consequences for your behavior. Apologize and ask forgiveness when you make a mistake. Give just rewards for appropriate behavior (which can be as simple as a polite “thankyou” or “I appreciate your help.”). Talk about justice in the community. Read stories together that reveal justice. Cultivate justice in your life. Practice taking other people’s perspective before reacting to them. Put yourself in your spouse’s shoes, your children’s shoes, your neighbors’ shoes and consider the situation from their perspective. Think and talk about the perspective the store clerk, the police officers, or the teacher. These simple practices will help you raise moral children…and help create a more moral world for your grandchildren. One of my Facebook friends posted this pic. 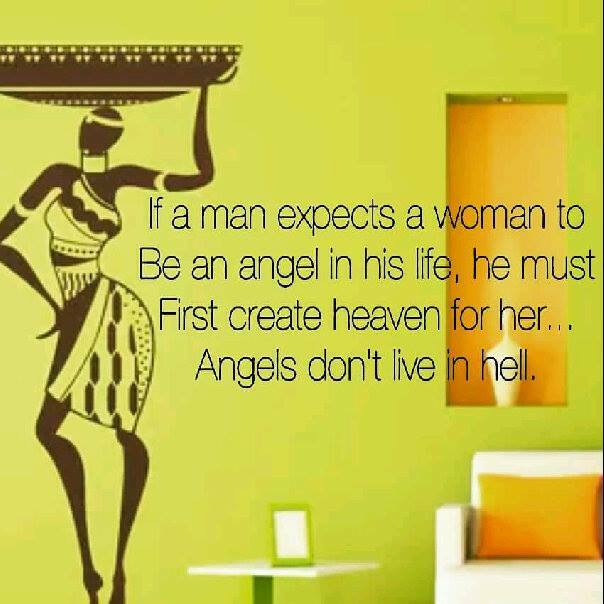 I love the proverb written on it: “If a man expects a woman to be an angel in his life, he must first create heaven for her…angels don’t live in hell.” I don’t know about you, but I want to live with an angel. So, I have to ask myself: how can I create heaven for my wife? How can I make my wife feel like an angel? Upon what is heaven built? Heaven is built on honor—treating one another as special, precious, sacred. To create heaven for your wife, treat her with honor. Honor her above all others like a diamond above coal. Constantly think about the character and beauty you adore in your wife. Don’t stop with merely thinking about your admiration of her character and beauty. Let your words and actions communicate love and admiration to your wife. Let your eyes sparkle with delight and adoration when she walks into the room. Speak of her with high praise when you describe her to others. Heaven is built on unfailing trust. To create heaven for your wife, live a life of integrity and faithfulness that will build trust. Let your actions and your speech enhance her sense of security and acceptance. Keep your promises. Be available. Remember: the small, positive moments build trust; so, enjoy playful interactions, simple adventures, joyful moments and moments of sorrow, friendly conversations, and laughter. Work to “keep in tune” with your wife’s emotions. Comfort her when she needs comforted. Rejoice with her when she rejoices. Rest with her when she needs rest. Join with her in life. Heaven is built on servanthood. To create heaven for your wife, become a servant in your marriage. Serve your wife by listening to her and accepting her influence. Serve her by cooking dinner, washing clothes, or running the vacuum. Serve her by asking what she would like you to do to help her. Become the leader of servanthood in your home. Heaven is built on sacrifice. Jesus willingly became the Sacrifice for our sin, a sacrifice that brought peace between man and God. Sacrifice opens the doors to heaven. To create heaven in your home, become a leader in sacrifice. Make small sacrifices like giving up the TV remote, giving away the last cookie, giving up your seat for your wife, giving up “the game” to take a walk…you get the idea. You may also make bigger sacrifices like giving up your music to listen to her music in the car, giving up time on your project to do what she desires, giving up the adventure movie to watch a “chick flick” followed by the emotional discussion of the movie…. You know what would prove a heavenly sacrifice in your home. And, you know that your sacrifice will produce greater security and open the doors for heaven in your home. 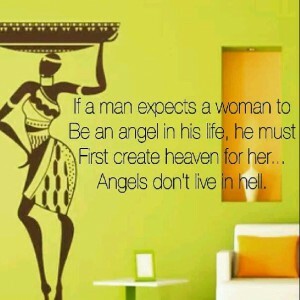 “Expect your wife to be an angel in your life”? Start creating heaven in your home. Build your home and marriage on honor, integrity and trust, servanthood, and sacrifice. Believe me, you will live with an angel…and you will get a taste of heaven on earth!